This study explored the tissue-protective properties of the continuous erythropoietin receptor activator (CERA) in an experimental model of (nonischemic) diabetic kidney injury (i.e., the db/db mouse). Mice were randomly treated with placebo (n = 25), low-dosage CERA (n = 25), and high-dosage CERA (n = 25). Also studied were 25 nondiabetic db/m mice. Hematocrit was comparable in placebo and low-dosage CERA–treated mice but increased significantly with high-dosage CERA (P < 0.01 versus both). Significantly reduced expression of TGF-β, vascular endothelial growth factor, and collagen IV was found in glomeruli and the tubulointerstitial area with CERA treatment, and these beneficial molecular effects were clearly dosage dependent (both P < 0.05 versus placebo). Similarly, CERA treatment caused a dosage-dependent increase in p-Akt, nephrin, and perlecan tissue expression (all P < 0.05 versus placebo). However, the accelerated mesangial expansion that was observed in placebo-treated db/db mice (versus db/m controls) was significantly reduced only in low-dosage CERA–treated mice (P < 0.01). Moreover, albuminuria was significantly reduced in low- but not high-dosage CERA–treated mice compared with placebo treatment (P < 0.05). In an ancillary study, phlebotomy was performed in high-dosage CERA–treated db/db mice to keep hematocrit within normal (baseline) levels. This procedure resulted in significantly (P < 0.05) less albuminuria as compared with high-dosage CERA–treated mice without phlebotomy, thus preserving the tissue-protective potential of CERA. Long-term CERA treatment has beneficial dosage-dependent effects on molecular pathways of diabetic kidney damage. Low-dosage CERA does not affect hematocrit and therefore may be a feasible method of tissue protection in this setting. Recent experimental studies revealed that erythropoietin (EPO) has numerous tissue-protective effects apart from its action on erythropoiesis and that it prevents vascular and tissue damage as a result of ischemia in the heart, the brain, and also the kidney.1,2 EPO maintains normal red blood cell mass by exerting a continuous antiapoptotic activity in erythrocyte precursors via stimulation of crucial surviving intracellular signaling cascades such as JAK2/STAT5 and phosphatidylinositol 3-kinase/Akt pathways.2 This signaling subsequently leads to phosphorylation of the proapoptotic factor Bad, which in turn dissociates from a cell survival factor, Bcl-XL, resulting in protection from programmed cell death. We recently demonstrated that long-term treatment with the recombinant human EPO (rHuEPO) analogue darbepoetin α conferred renal vascular and tissue protection, preserved renal function, and significantly improved survival in the remnant rat kidney model (five-sixths nephrectomy).3 Importantly, we used a hematologically noneffective dosage of darbepoetin to obviate potential adverse effects of rHuEPO therapy. In this experimental setting of chronic renal ischemia, darbepoetin persistently activated the Akt pathway and reduced apoptotic cell death in renal tissue. In this study, we set out to explore the therapeutic potential of another erythropoiesis-stimulating agent—the continuous erythropoietin receptor activator (CERA)—for tissue protection in an animal model of nonischemic chronic kidney injury (i.e., the leptin receptor knockout db/db mouse). In this animal model for type 2 diabetes, the mice develop characteristic molecular and clinical features of diabetic nephropathy.4 We administered a hematologically noneffective (low) and effective (high) dosage of CERA and studied several molecular pathways of diabetic kidney damage. CERA is chemically synthesized through integration of amide bonds between amino groups of rHuEPO and methoxy polyethylene glycol-succinimidyl butanoic acid. This modification results in a substantial prolongation of duration of action. The db/db mice became obese and developed frank hyperglycemia during the observation period when compared with their nondiabetic db/m littermates (Table 1). Blood glucose levels were already slightly higher in db/db mice in comparison with db/m mice at the start of the observation period, and in the next 2 wk, blood glucose increased significantly and remained consistently higher in db/db mice than in db/m controls. We observed no significant difference in blood glucose levels between untreated and CERA-treated db/db mice. Similarly, body weight was not affected by CERA treatment. Hematocrit increased in all four groups during the study period (Table 1), but this increase was more pronounced in the db/db mice. During the study period, we observed no significant difference in hematocrit levels between placebo- and low-dosage CERA–treated db/db mice. However, hematocrit increased significantly in high-dosage CERA–treated mice in comparison with all other treatment groups. At the end of the treatment period, systolic BP (SBP) was significantly higher in placebo-treated db/db mice (149 ± 3 mmHg) in comparison with db/m control mice (135 ± 3 mmHg). BP was not affected by treatment with low-dosage (146 ± 3 mmHg) and high-dosage (148 ± 4 mmHg) CERA (NS versus placebo-treated db/db mice). Kidney weight increased markedly in db/db mice and was significantly higher than in db/m mice (Table 2). It is interesting that in both CERA-treated groups, we observed a less marked increase in kidney weight as compared with placebo-treated db/db mice. Similarly, the kidney-to-body weight ratio differed significantly between nondiabetic db/m and diabetic db/db mice. In placebo-treated db/db mice, urinary albumin excretion was significantly higher than in db/m controls at baseline, week 6, and week 13. Albumin excretion was significantly reduced compared with placebo-treated db/db mice at both early and late time points with low-dosage CERA treatment. In the high-dosage group, albuminuria was significantly lower after 6 wk of treatment, whereas later, it returned to the level that was observed in placebo-treated db/db mice (Table 1). We observed no significant differences in serum creatinine levels between placebo-treated and low-dosage and high-dosage CERA–treated mice (data not shown). The glomerular appearance in placebo-treated db/db mice showed accelerated mesangial expansion characterized by an increase in periodic acid-Schiff–positive mesangial matrix area relative to that observed in db/m mice at the end of the study period (Figure 1). In mice that were treated with low-dosage CERA, the score was significantly reduced (P < 0.01). In contrast, in mice that were treated with high-dosage CERA, we observed an even higher score than in placebo-treated mice. Furthermore, we analyzed small arteries for evidence of arteriolar hyalinosis as a marker for diabetic vascular damage (Figure 1). We found no arteriolar hyalinosis in db/m control mice, whereas in placebo-treated db/db mice, a mild degree of arteriolar hyalinosis was present. Arteriolar hyalinosis was less frequent in mice that were treated with low-dosage CERA, but similar to the previous finding on mesangial expansion, we observed a higher degree of arteriolar hyalinosis in mice that were treated with high-dosage CERA. 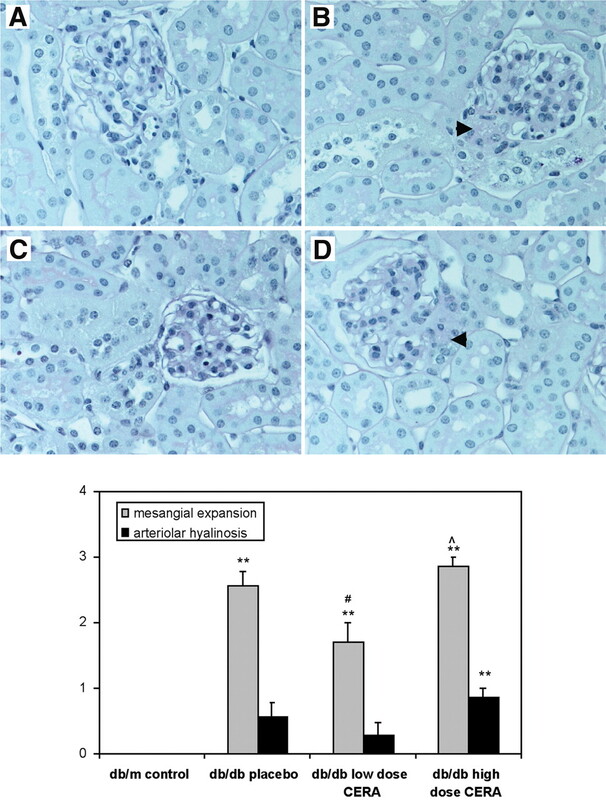 Mesangial expansion and arteriolar hyalinosis in renal tissue of db/db mice. Diabetic db/db mice were treated with saline (placebo) or continuous erythropoietin receptor activator (CERA) for 14 wk. Db/m nondiabetic mice were used as control. After the perfusion with Ringer solution, kidneys were excised, decapsulated, weighed, immersed in 4% formalin, and embedded in paraffin. Sections were stained with periodic acid-Schiff. (A) Db/m control mice. (B) Db/db placebo-treated mice. (C) Db/db mice that were treated with 0.4 μg CERA/kg per wk (low dosage CERA). (D) Db/db mice that were treated with 1.2 μg CERA/kg per wk (high dosage CERA). A semiquantitative analysis on a scale from 0 to 3 for presence of mesangial expansion and arteriolar hyalinosis (arrows) was performed (E). **P ≤ 0.01 versus db/m control; #P ≤ 0.05 versus db/db placebo treatment; ∧P ≤ 0.05 versus low-dosage CERA. To examine the underlying molecular mechanism of the clinical and laboratory observation, we first analyzed the expression of TGF-β1 as an important mediator of diabetic kidney damage (Figure 2, A through D). Not unexpected, we found significantly higher TGF-β1 expression in db/db mice as compared with db/m controls. It is interesting that we observed a dosage-dependent and significant reduction of TGF-β1 expression in mice that were treated with CERA. When we analyzed the collagen IV expression in glomeruli and the tubulointerstitial area, we found a similar pattern in the different treatment groups (Figure 2, E through H). Next, we analyzed the expression of nephrin (Figure 3, A through D). We found a significant reduction of the nephrin expression in db/db mice in comparison with db/m mice, whereas in tissue of CERA-treated mice, higher nephrin levels were detectable. The effect was dosage dependent. We found similar results when analyzing glomerular perlecan expression (Figure 3, E through H), a heparan sulphate proteoglycan. It is postulated that such proteoglycans play an important role in holding up the anionic charge of the filtration barrier and thereby prevent loss of albumin. Moreover, we observed an increase in glomerular vascular endothelial growth factor (VEGF) expression in the db/db versus db/m mice. This was reduced in a dosage-dependant manner by treatment with CERA (Figure 3, I through L). Finally, we found a significant reduction of p-Akt expression in renal tissue of placebo-treated db/db mice in comparison with db/m controls (data not shown). This reduction of p-Akt in renal tissue was significantly ameliorated in CERA-treated mice. Again, the effect of CERA was dosage dependent. TGF-β1 and collagen IV expression in renal tissue of db/db mice. Diabetic db/db mice were treated with saline (placebo) or CERA for 14 wk. Db/m nondiabetic mice were used as control. Immunochemistry was performed on paraffin sections. 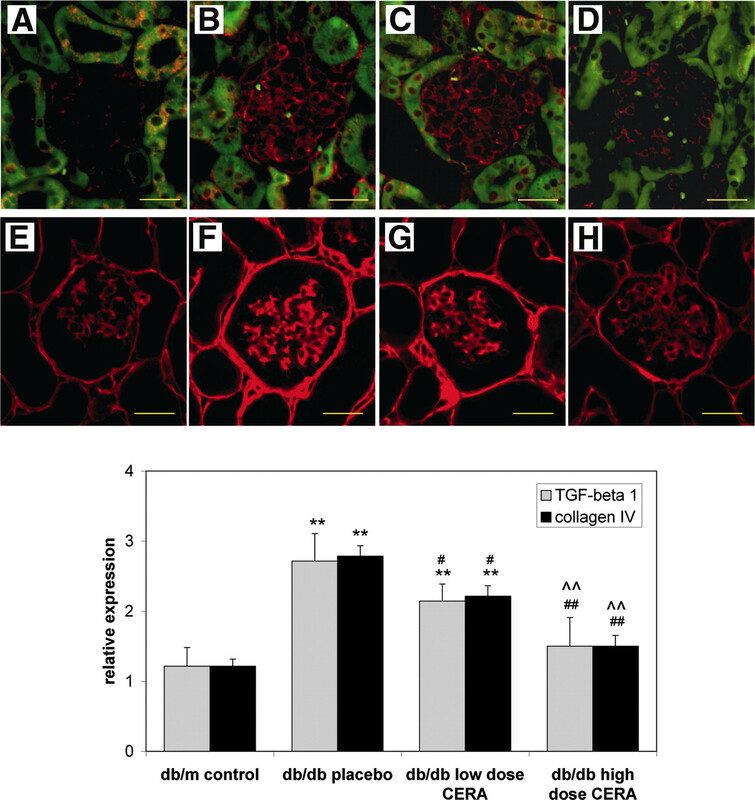 Representative pictures are shown for TGF-β1 (A through D) and collagen IV (E through H) staining. (A and E) Db/m control mice. (B and F) Db/db placebo-treated mice. (C and G) Db/db mice that were treated with 0.4 μg CERA/kg per wk (low-dosage CERA). (D and H) Db/db mice that were treated with 1.2 μg CERA/kg per wk (high-dosage CERA). TGF-β1 expression in glomeruli and the tubulointerstitial collagen IV expression were graded on a scale from 0 to 3. **P ≤ 0.01 versus db/m control; #P ≤ 0.05 versus db/db placebo treatment; ##P ≤ 0.01 versus db/db placebo treatment; ∧∧P ≤ 0.01 versus low-dosage CERA. Nephrin, perlecan, and vascular endothelial growth factor (VEGF) expression in renal tissue of db/db mice. Diabetic db/db mice were treated with saline (placebo) or CERA for 14 wk. Db/m nondiabetic mice were used as control. Immunochemistry was performed on cryosections. Representative pictures are shown for nephrin (A through D), perlecan (E through H), and VEGF (I through L). (A, E, and I) Db/m control mice. (B, F, and J) Db/db placebo-treated mice. (C, G, and K) Db/db mice that were treated with 0.4 μg CERA/kg per wk (low-dosage CERA). (D, H, and L) Db/db mice that were treated with 1.2 μg CERA/kg per wk (high-dosage CERA). Nephrin, perlecan, and VEGF expression in glomeruli was graded on a scale from 0 to 3. **P ≤ 0.01 versus db/m control; #P ≤ 0.05 versus db/db placebo treatment; ##P ≤ 0.01 versus db/db placebo treatment; ∧∧P ≤ 0.01 versus low-dosage CERA. Phlebotomy in high-dose CERA–treated mice resulted in hematocrit levels that were comparable to baseline values before the start of CERA treatment (Table 3). SBP at the end of the treatment period in high-dosage CERA–treated mice and in phlebotomized mice was comparable (142 ± 6 versus 146 ± 8 mmHg; NS). In phlebotomized mice, kidney weight as well as the kidney-to-body weight ratio were not significantly different from those in high-dosage CERA–treated db/db mice (data not shown). In contrast, in phlebotomized, high-dosage CERA–treated mice, urinary albumin excretion after 6 and 13 wk of treatment was significantly lower as compared with mice that were treated with high-dose CERA only (Table 3). In general, albumin excretion was lower in both groups of db/db mice as compared with those in the first experimental series because in this experiment, we studied younger animals (4 wk of age). The immunohistochemical analysis of renal tissue revealed similar patterns of TGF-β1, nephrin, and perlecan expression in both groups of db/db mice as compared with the high-dosage CERA–treated mice in the first experiment (Figure 4). Above that, TGF-β1 expression was comparable in mice that were treated with high-dosage CERA and in high-dosage CERA–treated, phlebotomized mice (Figure 4, A and B). This was also true for nephrin (Figure 4, C and D) and perlecan (Figure 4, E and F) tissue expression. In summary, TGF-β1, nephrin, and perlecan expression was not significantly different in mice that were treated with high-dosage CERA (Figure 4, A, C, and E) and high-dosage CERA–treated, phlebotomized db/db mice (Figure 4, B, D, and F). Finally, we found a comparable expression of p-Akt expression in renal tissue of both groups of mice (data not shown). TGF-β1, nephrin, and perlecan in renal tissue of phlebotomized db/db mice. Diabetic db/db mice were treated with 1.2 μg CERA/kg per wk (high-dosage CERA) and high-dosage CERA plus phlebotomy for 14 wk. Immunochemistry was performed on paraffin sections. Representative pictures are shown for TGF-β1 (A and B), nephrin (C and D), and perlecan (E and F) staining. (A, C, and E) Db/db mice that were treated with high-dosage CERA. (B, D, and F) Phlebotomized db/db mice that were treated with high-dosage CERA. TGF-β1, nephrin, and perlecan expression in glomeruli was graded on a scale from 0 to 3. *P ≤ 0.05, **P ≤ 0.01 versus high-dosage CERA. In this study, we documented that long-term treatment with CERA has striking effects on different molecular pathways in an experimental model of diabetic kidney damage: The db/db mouse. 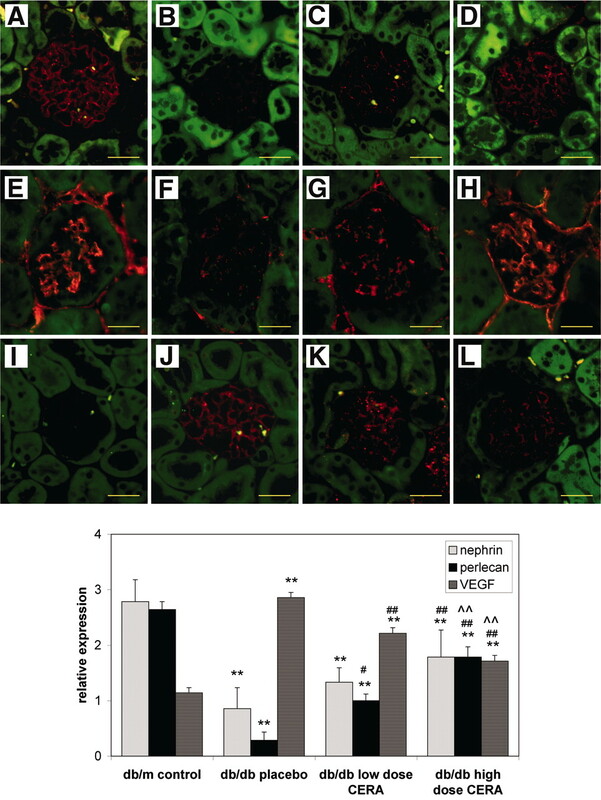 Long-term treatment with CERA not only reduced mediators of accumulation of extracellular matrix in diabetic nephropathy, such as TGF-β1, but also prevented the loss of nephrin in glomeruli of treated mice. To our knowledge, this is the first description of a positive effect of an erythropoiesis-stimulating agent in a model of nonischemic renal tissue injury. So far, positive effects of rHuEPO administration have been documented only in experimental models of acute ischemia/reperfusion kidney injury5–8 or chronic vascular injury to the kidney,3 similar to what has been shown in numerous studies in the heart.2 In these experimental settings, the main action of rHuEPO was inhibition of apoptosis in renal and cardiac tissue. However, in most of these studies, very high dosages of rHuEPO have been administered only once or for a short period to obviate potential adverse effects of rHuEPO therapy. Particularly, effects on the number and activation state of thrombocytes and the stimulation of platelet adherence to endothelium could mitigate the beneficial effects of a long-term high-dosage therapy on the kidney.9,10 In addition, changes in blood viscosity because of marked erythrocytosis and tissue generation of endothelin may work against the positive effects of rHuEPO.11 In line with these experimental data are our findings with high-dosage CERA treatment in db/db mice. We could clearly show beneficial dosage-dependent effects of CERA on molecular pathways of diabetic kidney damage, yet mesangial expansion was not reduced after 14 wk of high-dosage CERA treatment. As a consequence, urinary albumin excretion rate, which decreased by week 6 of treatment, increased again with ongoing high-dosage therapy. This result is in contrast with low-dosage CERA, for which the increase in albuminuria during the observation period was significantly reduced compared with placebo treatment, although this renoprotective effect of low-dosage CERA was not complete. To explore further the confounding effect of increased hematocrit levels in this experimental setting, we performed an additional series of experiments in which high-dosage CERA–treated mice were phlebotomized to achieve hematocrit levels that were comparable to those at baseline (i.e., before the start of high-dosage CERA treatment). We could indeed show that this procedure prevented the adverse effects of increased hematocrit levels (i.e., reduced the increase in microalbuminuria in high-dosage CERA–treated animals, thereby exposing the tissue-protective potential of CERA). Further studies are warranted to elucidate the molecular mechanism(s) by which a rise in hematocrit with hematologically effective CERA dosages (and presumably also with rHuEPO) lessens the beneficial effects on the molecular pathways of diabetic nephropathy. Moreover, establishing a minimal effective dosage may also provide a new strategy to prevent progression in diabetic kidney disease as well as other conditions of chronic kidney injury. The Animal Care Committee of Lower Saxony approved the study. We studied 75 male diabetic db/db (BKS.Cg-m+/+Leprdb) and 25 male nondiabetic db/m control mice (Charles River Laboratories, Sulz-feld, Germany). All mice were 6 wk of age at the beginning of the study. They were housed with 12:12-h light-dark cycles and had free access to food and water. Using a parallel-group study design, we randomly allocated the db/db mice to receive a weekly injection of (1) 0.9% NaCl (placebo; n = 25), (2) 0.4 μg CERA/kg body wt (low dosage; n = 25), and (3) 1.2 μg CERA/kg body wt (high dosage; n = 25). CERA was provided by Roche Diagnostics (Penzberg, Germany). It is chemically synthesized through integration of amide bonds between amino groups of rHuEPO and methoxy polyethylene glycol-succinimidyl butanoic acid. The resulting molecular weight of approximately 60,000 Da causes a considerably prolonged elimination half-life, thereby prolonging the action of CERA on its target tissues. Recently published reports have specified that the half-life of action of CERA in humans is approximately 130 h.32 We determined hematologically noneffective (low) and effective (high) dosages of CERA in an ancillary dosage-finding experiment. The main study duration was 14 wk, and we assessed body weight of mice at baseline and every 2 wk after the start of treatment. In addition, SBP was measured in conscious mice with an occlusive tail-cuff plethysmograph attached to a pneumatic pulse transducer (TSE BP system, Bad Homburg, Germany). For these measurements, we kept mice at 37°C. Furthermore, we assessed blood glucose with an Ascensia glucometer (Bayer Diagnostics, Leverkusen, Germany) and hematocrit with a vet scil abc (SCIL, Vierheim, Germany) at baseline and at regular intervals throughout the study. Finally, for the assessment of 24-h albuminuria, we placed mice in separate mouse diuresis cages (Tecniplast, Hohenpeissenberg, Germany) with access to water (but not food) for 24 h. We measured urinary albumin concentration at baseline and after 6 and 13 wk with an ELISA specific for mouse albumin (Albuwell M; Exocell, Philadelphia, PA). SBP was measured by a noninvasive tail-cuff method with the BP-2000 BP analysis system (Visitech Systems, Apex, NC). Ten mice from each group underwent repeated measurements on two different days 2 wk before the study end. After 14 wk of follow-up, we obtained renal tissue for morphologic and immunohistochemical analyses. For this purpose, 10 mice from each group were narcotized and the kidneys were perfused with Ringer lactate via the left ventricle. After the mice were killed, sagittal sections of the kidney were fixed in 4% neutral buffered formalin, embedded in paraffin, sectioned at 2 μm, and stained with the periodic acid-Schiff reagent. Coded tissue sections were analyzed by an investigator who was blinded with respect to the allocation of mice to the treatment groups. Forty glomeruli from each mouse were examined, and the amount of mesangial expansion was graded as follows: 0, no changes; 1, minor, mesangial expansion up to the diameter of two nuclei; 2, moderate, mesangial expansion with a diameter of 3 to 4 nuclei; 3, severe, mesangial expansion with a diameter of more than 4 nuclei. Similarly, arteriolar hyalinosis in the tissue sections was graded as follows: 0, no changes; 1, minor, few arterioles involved; 2, moderate, <50% of arterioles involved; 3, severe, >50% of arterioles involved. Immunohistochemistry was performed on cryostat sections of the frozen kidneys or on paraffin sections as described previously.33 The following primary antibodies were used: Anti–TGF-β1 (Santa Cruz Biotechnology, Santa Cruz, CA; cat. no. sc-146), anti-VEGF (Santa Cruz Biotechnology; cat. no. sc-152), anti–type IV collagen (Southern Biotechnology, Birmingham, AL; cat. no. 1340-01), polyclonal rabbit anti-rat phospho-Akt (Ser473), polyclonal guinea pig anti-nephrin (Research Diagnostics, Concord, MA), and monoclonal rat anti-perlecan (Research Diagnostics). For indirect immunofluorescence, nonspecific binding sites were blocked with 10% normal donkey serum (Jackson ImmunoResearch, West Grove, PA) for 30 min. Sections were then incubated with the primary antibody for 1 h. For fluorescence visualization of bound primary antibodies, sections were further incubated with Cy3-conjugated secondary antibodies (Jackson ImmunoResearch) for 1 h. Specimens were analyzed using a Zeiss Axioplan-2 imaging microscope with the computer program AxioVision 3.0 (Zeiss, Jena, Germany). Semiquantitative analysis of nephrin, perlecan, TGF-β1, and VEGF expression in 40 glomeruli per animal; of collagen IV and p-AKT expression in the kidney; and TGF-β1, collagen I, and p-AKT expression in the heart was done by using the following scoring system: 0, no; 1, weak; 2, moderate; and 3, strong expression. The investigator performing these immunohistochemical analyses had no knowledge of the treatment group assignment. In an additional experiment, we investigated the effect of phlebotomy in high-dosage CERA–treated db/db mice. Using a parallel-group study design, we randomly allocated 4-wk-old db/db mice to receive a weekly injection of (1) 1.2 μg CERA/kg body wt (high dosage; n = 20) and (2) 1.2 μg CERA/kg body wt (n = 20) plus phlebotomy. Phlebotomy was performed in narcotized mice at regular intervals throughout to keep hematocrit within normal (i.e., baseline) levels. The assessment of clinical and laboratory data and the immuno-histochemical evaluation of renal tissue were identical as described previously. In these additional experiments, we analyzed only the expression of key molecules of diabetic injury in renal tissue (TGF-β1, nephrin, and perlecan). We used the InStat statistical program (InStat, San Jose, CA). The statistical significance was set at P < 0.05, and data are presented as means ± SEM. We compared baseline and end point characteristics with ANOVA and appropriately corrected t test for random data. This study was supported by an unrestricted research grant from Roche Diagnostics (Penzberg, Germany).